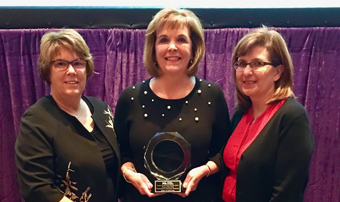 The March of Dimes and Omaha Magazine hosted the 2018 Nurse of the Year Awards, presented on Nov. 15. More than 180 nominations were received across Nebraska and Western Iowa; 15 total were from Methodist Hospital, Methodist Women's Hospital and Methodist Jennie Edmundson Hospital. Methodist nurse Jean Armstrong was given top honors as the 2018 Nurse of the Year. Armstrong has been manager for Family and Community Health Resources at Methodist Jennie Edmundson Hospital since 1996. She has also served as the Coordinator of the Shaken Baby Task Force since 1997. March of Dimes pays tribute to the nursing profession by recognizing extraordinary nurses throughout the community. Nurses are nominated by peers, nurse managers, supervisors or the families they have impacted. Each application is blinded, carefully reviewed and scored by a committee of Chief Nursing Officers and Nurse leaders from the health care community in Nebraska and Western Iowa. Congratulations to our Methodist nurses for your achievements!